Twitter's not just plotting to potentially spam our feeds - it's also looking to make social network shopping a very real thing. A number of users of the Android Twitter app are reporting that a new "Payment and shipping" option has popped up in their Settings, although currently tapping on it will do nothing. While it's not yet functional, it serves as a pretty significant hint that Twitter is planning a move into tweet-based shopping - especially as it seems like a fair few users are seeing the new option, a simple Twitter search reveals. Earlier this year, Re/Code spotted a "buy now" button that was appearing on some tweets, linking to the retail site Fancy. Having a quick way to pay will be essential to this, and today's news suggests Twitter is on the case. Meanwhile a recent deal with Amazon started offering users a way to quickly add things to their shopping basket via the social network. 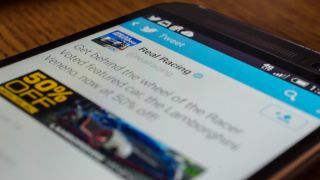 In sum, Twitter's got big plans for e-commerce, and it might not be long before we see more of them put into action.